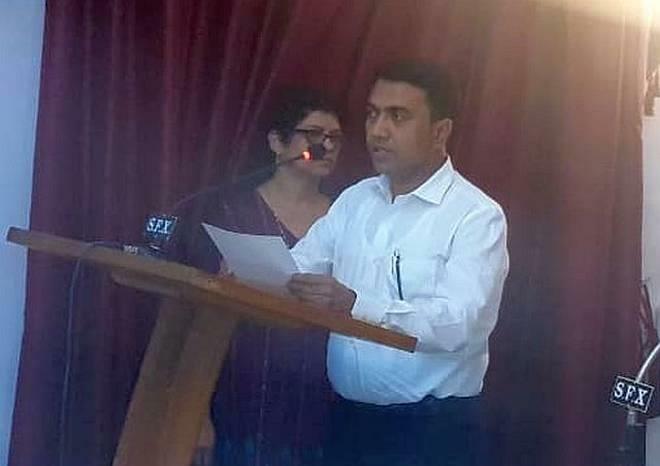 Panaji, March 19: Former Speaker of Goa legislative assembly and BJP MLA Pramod Sawant was sworn in as the 11th Chief Minister of Goa on Tuesday. "Parrikar is not among us now and this responsibility has been given collectively to me by my party, alliance partners and independent MLAs. This is a big responsibility," Sawant told reporters soon after he was sworn in. "I am committed to the development of Goa and to take forward the teachings of former Chief Minister Manohar Parrikar with a positive outlook," Sawant also said, adding that he would focus on completing all infrastructure related projects started by his predecessor. "The number of years you spend as an MLA does not make you senior. Everytime you get elected you are there for a five-year term. Unfortunately, some of my colleagues with us (BJP) or in the alliance were expecting something else better... That is what delayed the whole thing," Cabral said. Earlier, ahead of Sawant's swearing-in ceremony, the Congress had accused Governor Sinha of allowing BJP time to indulge in "horse trading" and being biased against the party. The party's spokesperson Sunil Kawthankar maintained Congress was the single largest party in the 36-member state legislative assembly. The Congress has 14 MLAs as against the BJP's 12. "We strongly condemn the undemocratic action of Governor Sinha for not allowing our single largest party to form the Government and allowing BJP to carry on horse trading, despite BJP not having sufficient numbers to form the government," Kawthankar had said.